It breaks my heart a bit to see all that has been going on in Turkey, and to hear remarks about how people are scared to travel there or have no interest. I visited Turkey last September when my brother and his wife were still living there. 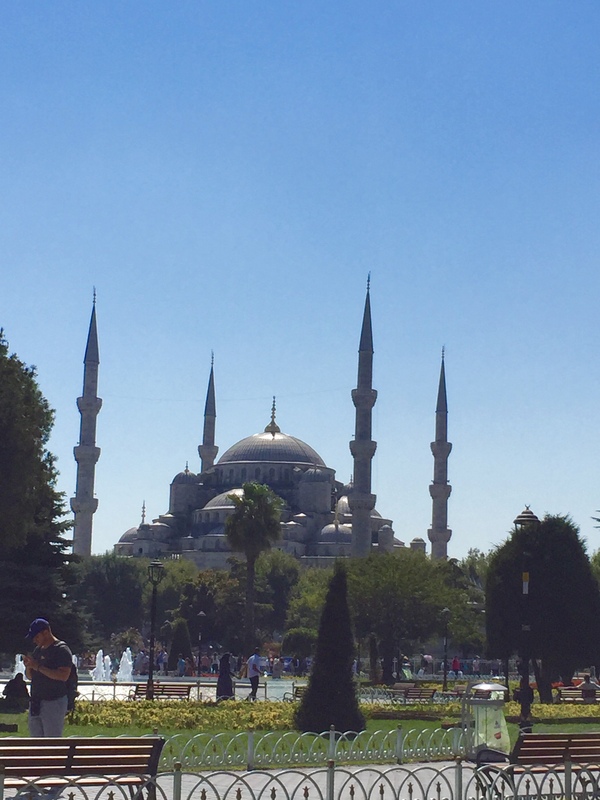 We visited Istanbul, Bozcaada, and Izmir, and I must say – Turkey is such an incredible place. It was beautiful – stunning. The people were so friendly. And there was so much culture everywhere we went. 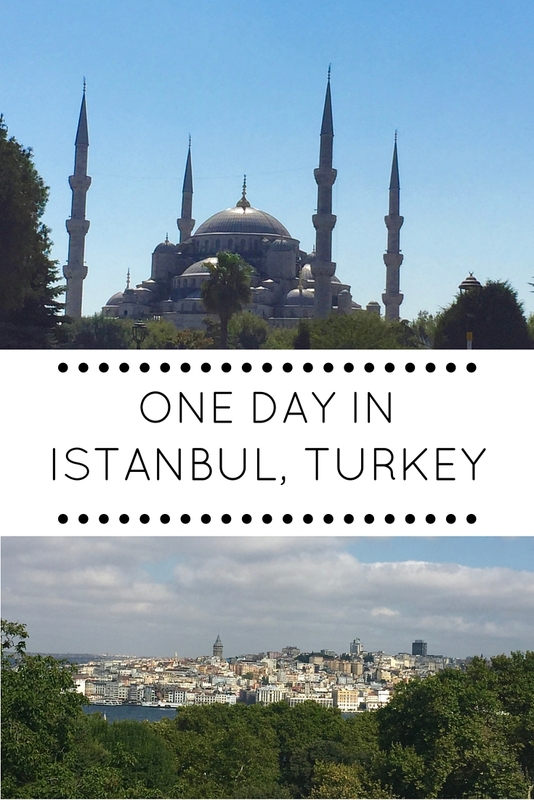 I’m republishing this guide to try to encourage travelers to visit Turkey. If you do not personally feel comfortable, then don’t go now. However, you must go at some point! I promise you – you won’t regret it. My trip started with a visit to Istanbul, and I couldn’t have been more impressed! We only had one day to see all of the sights, so we planned in advance and tried to squeeze as much in as possible. It’s totally doable! We visited a large portion of the major sights and probably could have visited more if we didn’t have to stop and take breaks from the heat. Note: Our Airbnb was centrally located near all of the Old Town sites so we were able to wake up early and start the day immediately. I highly recommend this for anyone looking to accomplish so much in one day. Note – Before you visit any sights, purchase the museum pass. It costs ~£18 and provides access to all of the major sights, as well as access to the harem in Topkapi Palace. It’s well worth it! 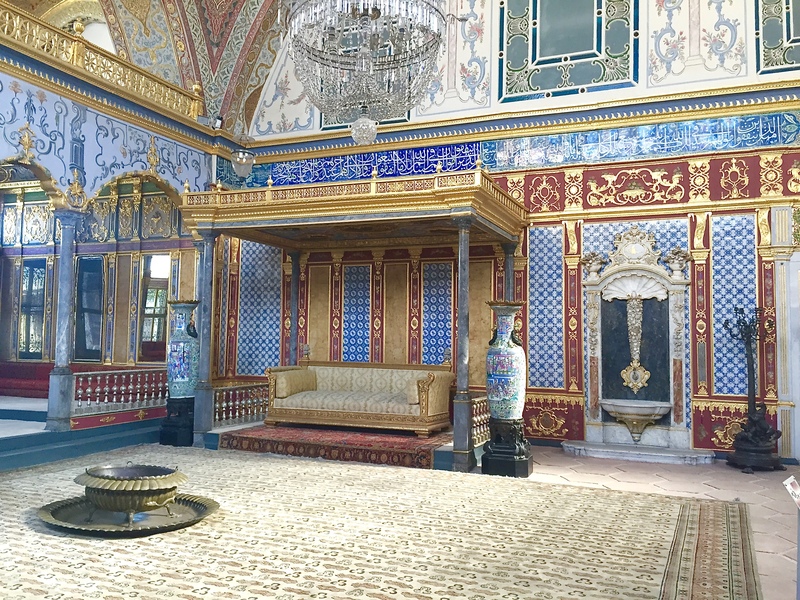 Topkapi Palace is very similar to all other palaces – historic, ornate, beautiful. However, it is also in Turkey, and has details that you do not come across often. The palace rooms house a ton of artifacts, including massive diamonds and the belongings of the prophets (i.e., Moses’ staff). The Harem apartment is included in the Museum Pass, as well, and really allows you to understand how wealthy individuals lived. They had a room for literally everything, including circumcision! The views from the palace are also stunning. 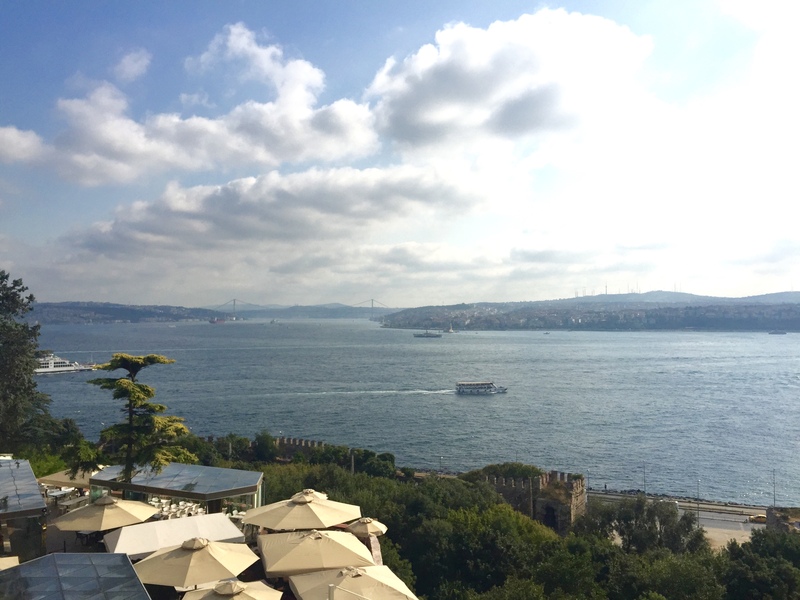 The Bosphorus and what feels like all of Istanbul are within sight and it is simply breathtaking. 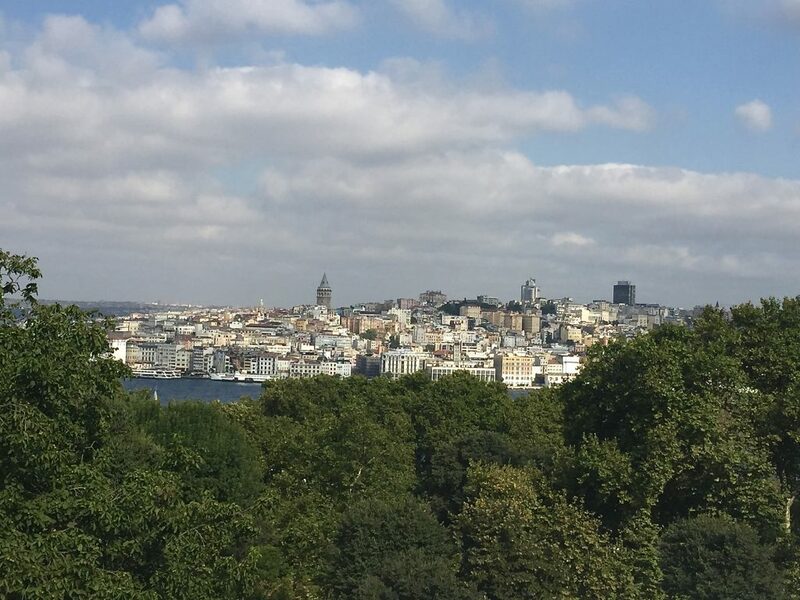 Alternatively, you could swap out Topkapi Palace to wake up and head straight to Dolmabahce Palace. However, you’d probably have to cut something else out since it’s a bit further out! 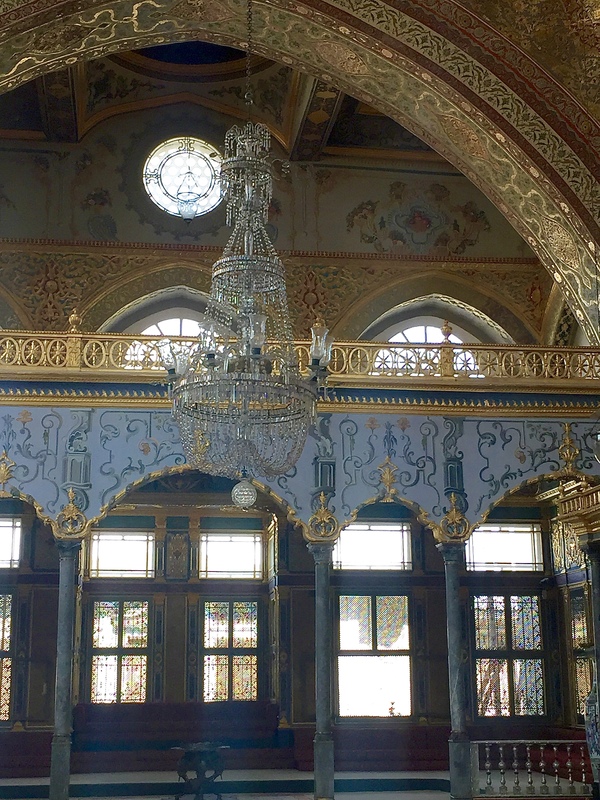 I didn’t get the chance to visit Dolmabahce, but my brother and sister-in-law did and they loved it! 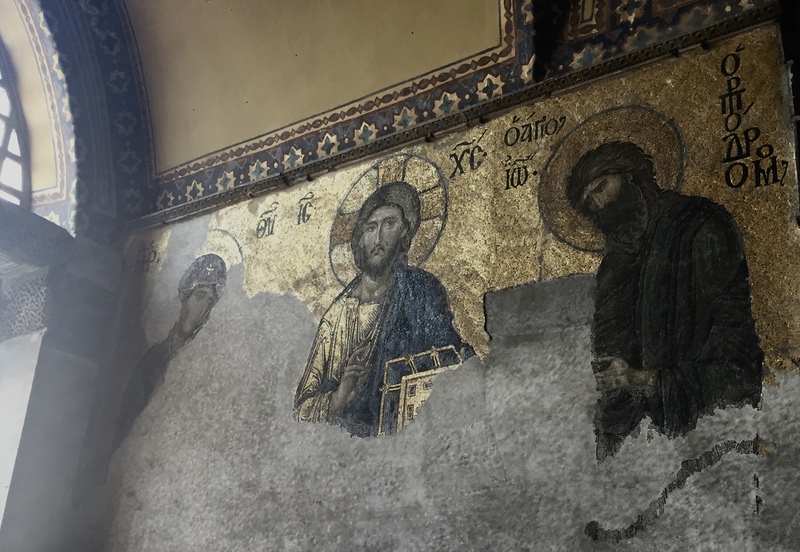 After Topkapi, visit the Hagia Sofia. It’s a bit run down (but under restoration), but also so incredibly preserved for what it is. 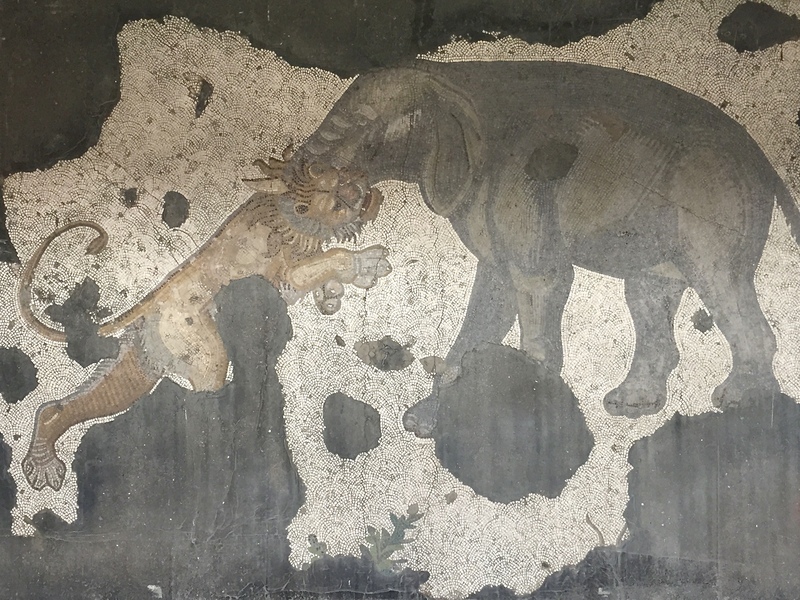 There is incredible art on the walls that is so well preserved, with just a part or two missing or falling apart. I found it to be such a fulfilling experience to stand inside such an instrumental and historic building. You can’t miss this when in Istanbul! After exploring Topkapi Palace, head into Basilica Cistern to be wowed by the structure. This may have been my favorite part, simply because we just randomly decided to go in. The columns are fascinating to look at because there are so many of them and they seem so perfect – straight, symmetrical, built the same. The lighting, or shall we call it mood lighting, lights the whole place up, making it a spectacle to be seen. For us, it was nice to get in somewhere dark and underground after being hot and sweaty for the first couple hours of the day. 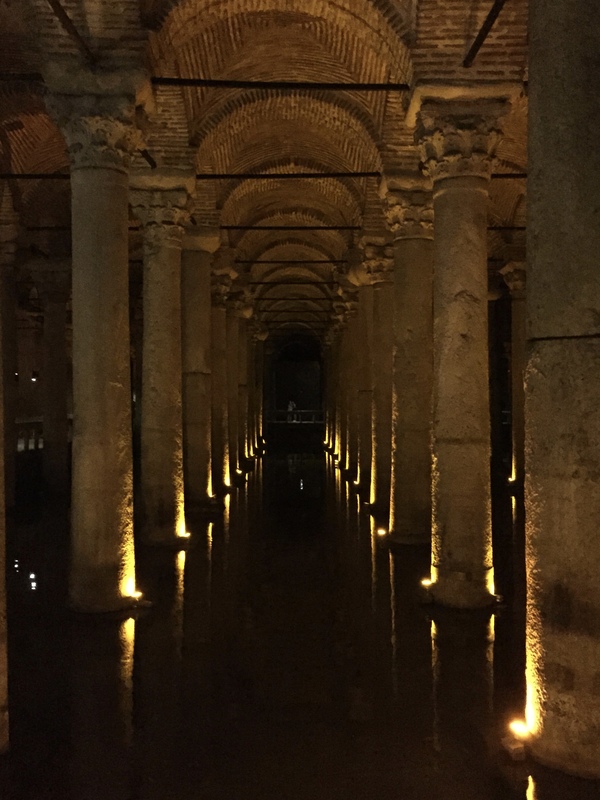 Note, Basilica Cistern was not included with the museum pass, but was worth the 20 Tl. The Grand Bazaar is probably the first thing you thought of when you saw the words Istanbul – and I don’t blame you! It’s a beautiful place with so much culture! With a mix of so much color, quirky items, and chatter that you simply cannot escape, it’s definitely an experience worth having. On my trip, I was too shy to bargain, but thankfully my brother did it for me. I walked away with a hand painted Turkish tea set and spoon rest (they look great in my house!). The Blue Mosque closes for morning prayer and usually reopens around 2pm. Beware of this when planning your day and watching the time. If you arrive before prayer ends, you can explore the gardens. For this, you will need to cover your shoulders, your head (women) and your knees. Also, do not wear leggings or anything that hugs your legs tightly – you will be asked to cover up. If you forget anything, though, don’t worry – they have stuff to borrow! 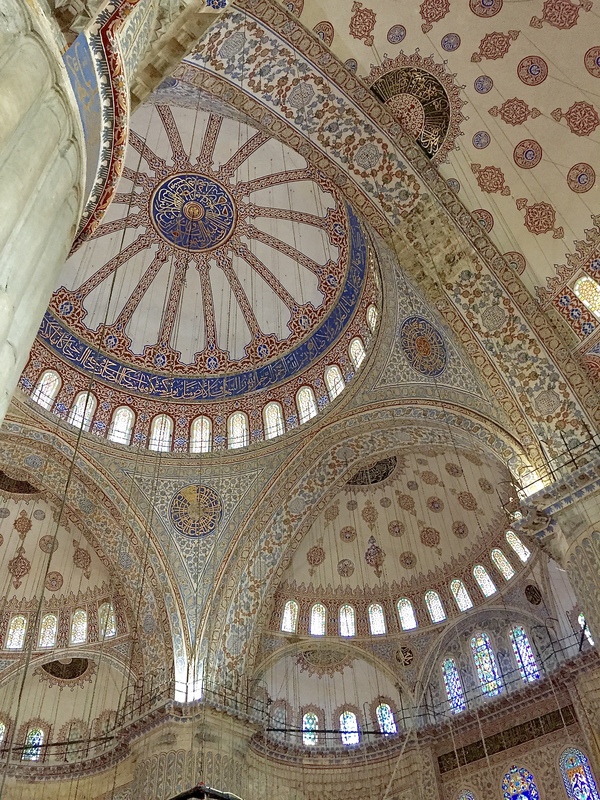 The Blue Mosque is absolutely stunning inside, and so peaceful. We wandered around a bit and then went into the Mosaic Museum, which is located nearby. 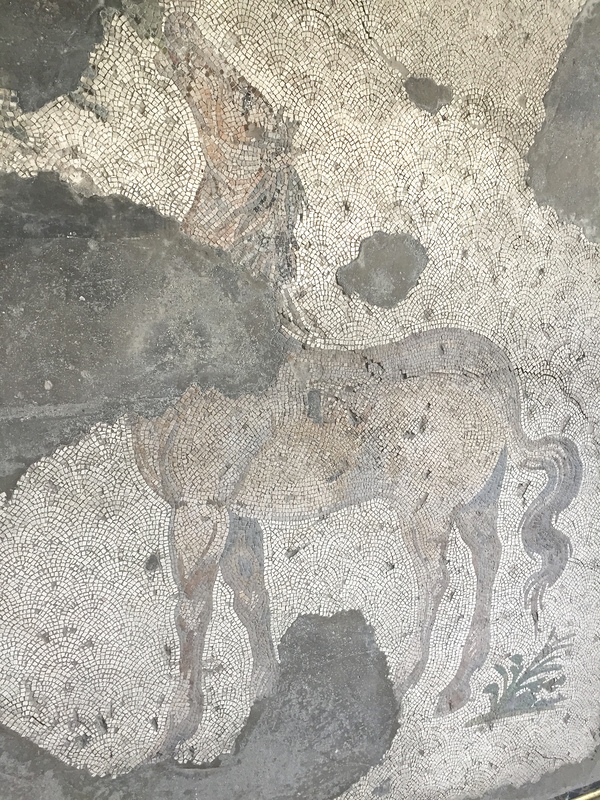 The Mosaic Museum had all of these Mosaics that were wonderfully preserved. Outside, there was another smaller Bazaar with beautiful art which we shopped around in a bit before going for ice cream. Sometimes, after a long day of exploring, it’s nice to do something a bit more chilled out. 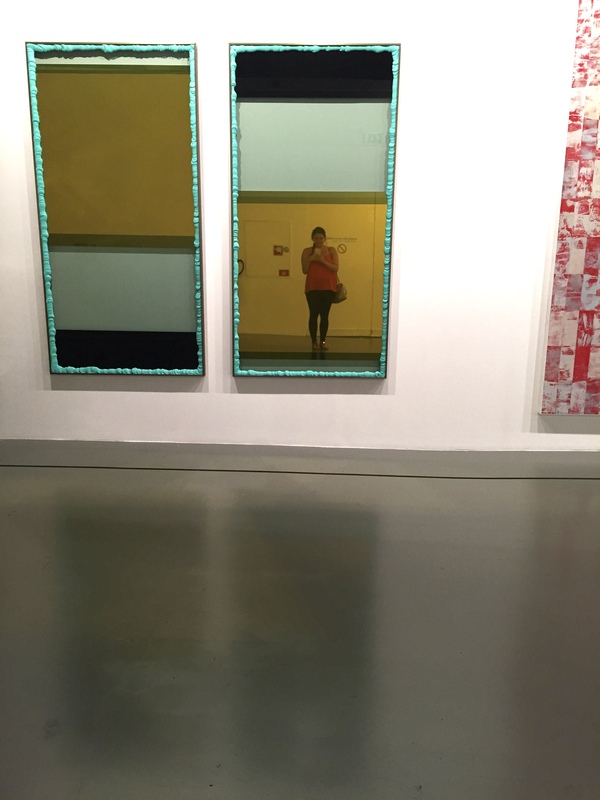 We read about Istanbul Modern and decided to pay a visit, and I recommend it for anyone who enjoys art! 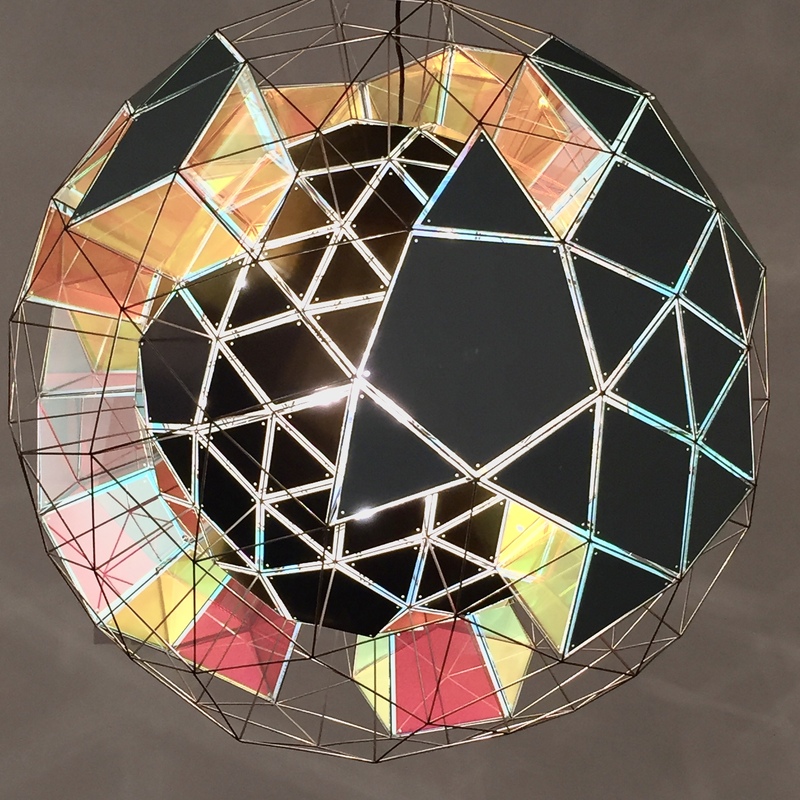 As opposed to weird, abstract modern art, this museum felt more like a quirky home decor shop. There were a couple of items I ended up googling after because I wanted replicas for my house! Bonus: the museum is air conditioned, which is much needed after a day in the Istanbul heat. After dinner, find a genuine Turkish cafe, grab a seat outside, and order some tea and hookah. It is the perfect way to end a day in Istanbul. Turkish tea is incredible, but most cafes also have an apple tea, which is a great alternative to dessert! Taksim Square is a great area for this – if you wander out of the main part where all of the shops are, there are plenty of alleyways that are absolutely stuffed with little restaurants and cafes. This itinerary makes it seem like we didn’t eat at all. That’s not the case! There were plenty of meals, and a few ice cream stops in between the meals. I chose not to include many food recommendations because we just chose places that we stumbled upon when we got hungry, which is what I recommend in Istanbul. When trying to cram so much into a day, it’s hard to plan meals. Instead, as it dawns on you that it is time to eat, pop into a cafe! I recommend trying Iskender kebap! However, I will recommend Bosphorus Brewing Company for any beer lovers – it’s a bit out of the way, but has a wide range of food and plenty of beers to try. 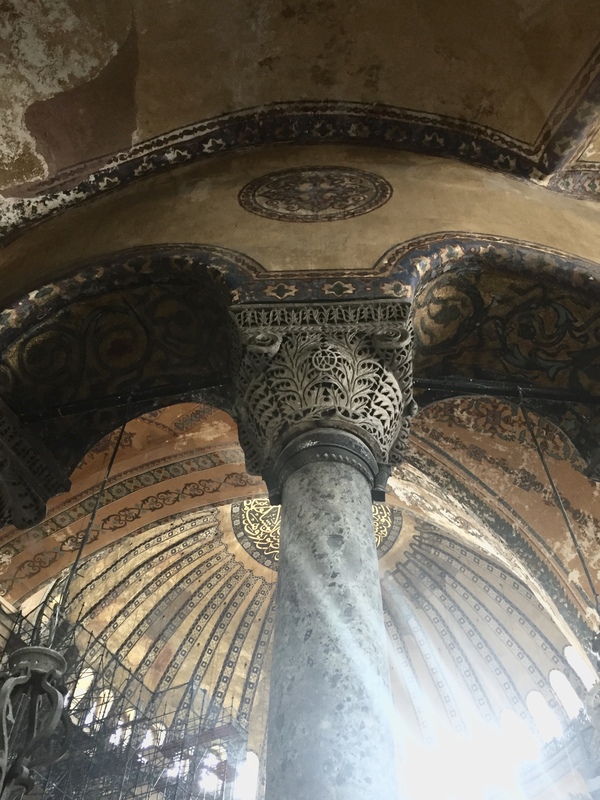 If you’re looking for more to do in Istanbul or Turkey as a whole, my sister-in-law, Sarah, has a ton on her blog, which chronicles the year they spent living in Izmir! 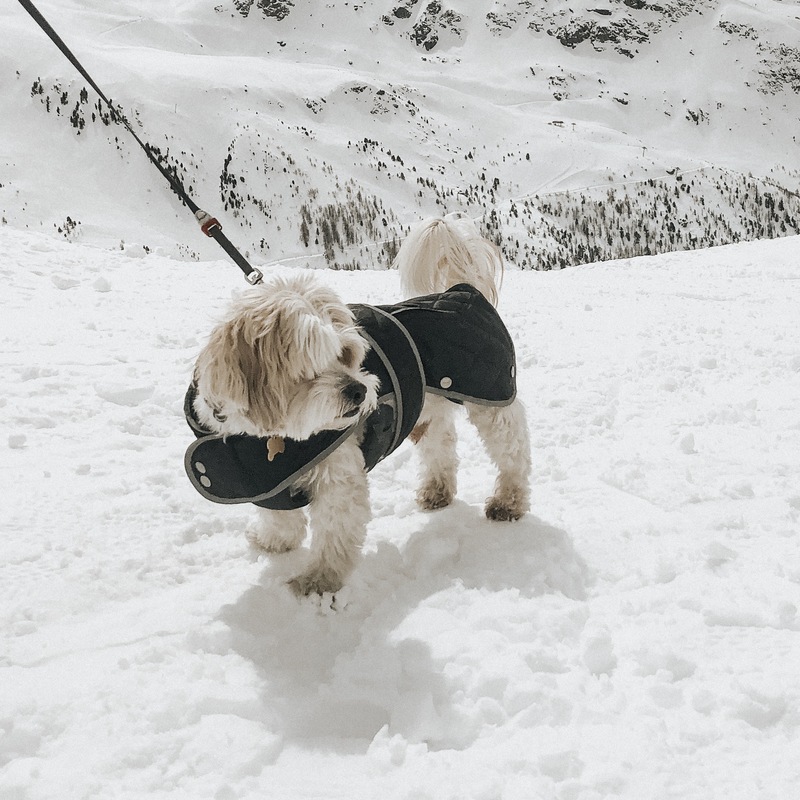 Note: This post has been adapted from an article originally posted by Kelly on The Kelly Hogan Kronicle. Have you ever crammed an entire city into one day and felt satisfied with the amount you covered? Link us to your itineraries in the comments below! Great itinerary! I went to Istanbul last year before all those attacks happen and I loved the city. It is charming and energetic at the same time – there is no other city like it. Thanks! It really does offer such a unique experience! I absolutely loved Istanbul and you have captured its spirit perfectly. I have also visited several other places in Turkey which were all beautiful with friendly, welcoming people and lovely food. It’s very sad what’s going on there. Thank you Sandy! It is an absolutely incredible country; I hope I have the chance to visit more of it soon! Istanbul has always been on my list. I hope one day I get to go! So many great cultural and historical and religious sites…it’s really an amazing melting pot! You are so right about it being a melting pot! 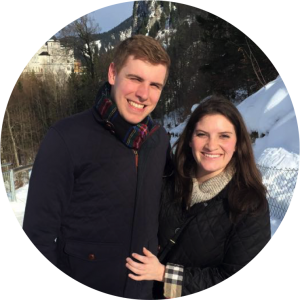 I hope you get to go one day, too – it’s a great experience! All the people I know who have visited Istanbul before only had praises for it. Great post you have here, I hope to visit one day and check out the palace and all the museums! 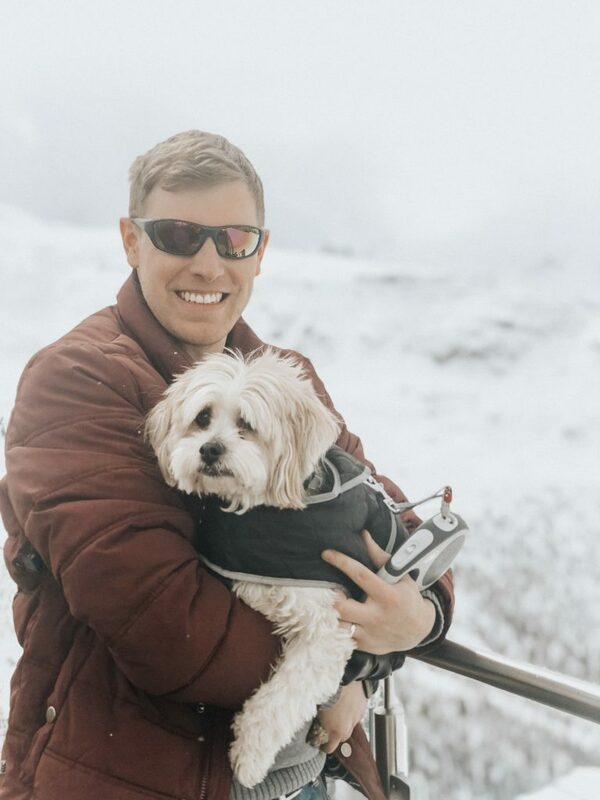 I would say the only negative thing I encountered was the heat….but it was an excuse to stop for ice cream, so am I really complaining? Thanks for putting this together! I’m dying to visit Istanbul as well as other destinations in Turkey, so will definitely bookmark this for when we plan the trip! I can’t wait to visit Turkey. I haven’t been yet (though I hope to go within the next few years). I’d love to spend at least 3-4 days in Istanbul, but it seems like it is possible to enjoy the city’s highlights even if you only have one! I definitely have Turkey in my bucket list and hope to get there sooner rather than later. There are so many amazing sites to see in Istanbul. I am amazed that all this can be done in one day. It was a tight squeeze, but considering we also fit a nap it, I’d say it was a pretty successful day! 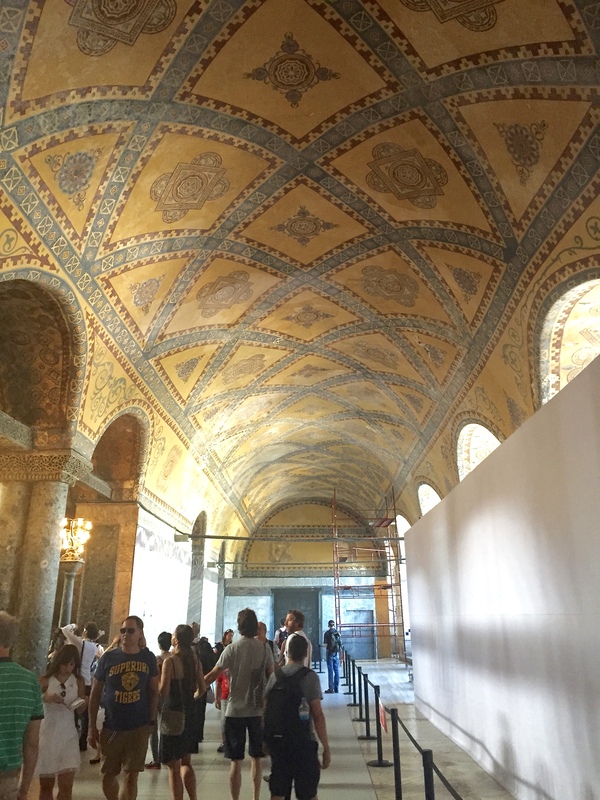 I really love the architectural designs in the museum, I always heard about Istanbul, but your blog makes it great. Thank you so much! It was such a beautiful city, so pretty easy to photograph 🙂 I highly recommend a visit if you get the chance! I’ve been in love with that city the moment I stepped off the place 5 years ago, and I’ve gone back every year. Hoping to sneak in a visit this year too. A quick addition if you’re there longer- head over to the Asia side and hang out there at night. Such a cool vibe. I would love to go back and explore the Asia side! I also didn’t get a chance to do a rooftop bar, and that is one of my favorite things to do in a city. Hopefully Sean and I will make it back there together, soon! If you’re ever back there, I recommend a quick trip to Izmir to explore the wine region – if you like wine, that is! 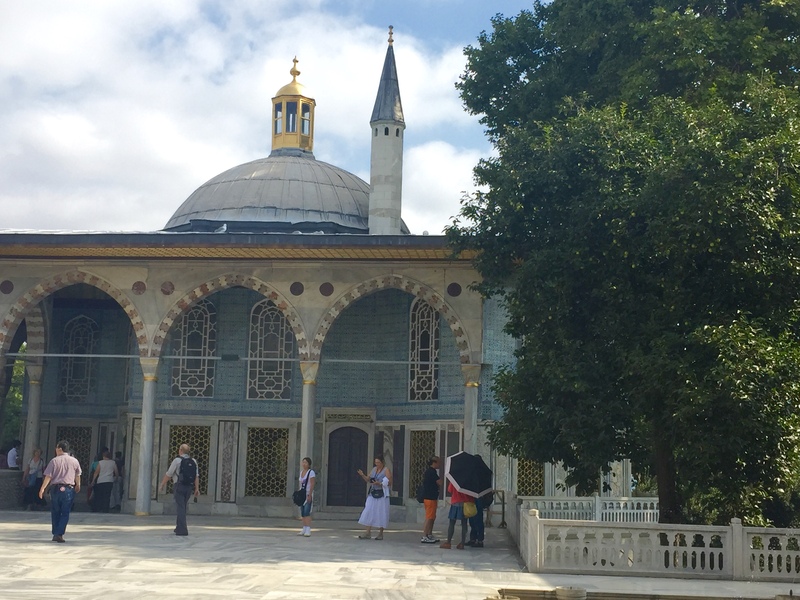 Thank you for writing this post and encouraging people to visit the hearbreakingly beautiful Istanbul. Having lived there for the last year, it also breaks my heart to see how scare people are to visit. Hope for better times for Turkey. Happy travels! 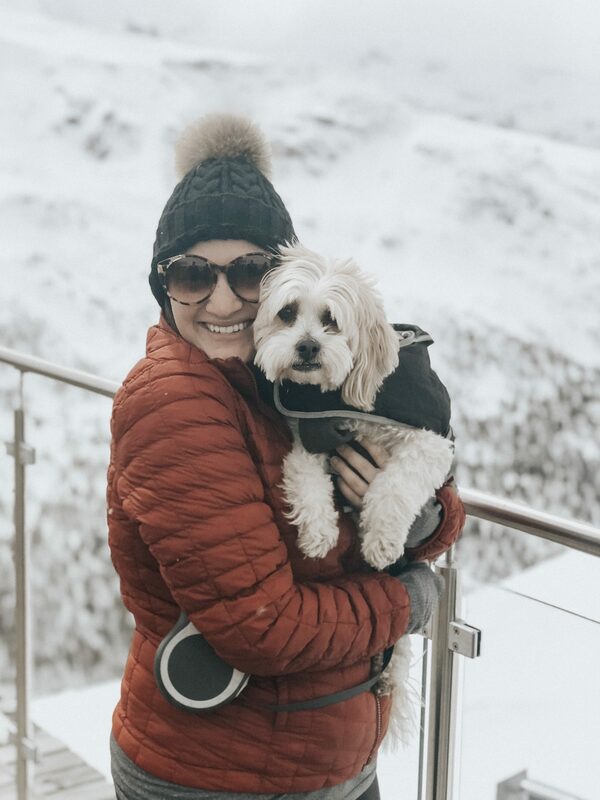 I share your sentiment – I visited a few years ago and never published my city guide with the recent turmoil the city unfortunately experienced. You’ve inspired me to consider posting it because you’re right, the city deserves to have more visitors experience its splendor! I know that things need to clear up a bit, and that people will go when they’re ready, but I want Istanbul (and Turkey as a whole) to remain on people’s minds as a destination. I already have friends from the US saying they don’t want to come to Europe because there have been so many random attacks; if that’s the mindset I don’t think anyone would ever go to Turkey again! But that shouldn’t be the case because it really is an absolutely incredible place!